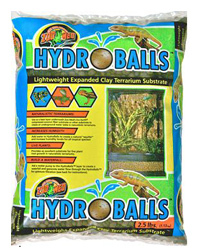 HydroBalls Expanded Clay Terrarium Substrate can be used as a base layer underneath Zoo Med's Eco Earth® coconut fiber substrate or other substrates to create an underground water table in Naturalistic Terrariums. Add water to create a natural "aquifer" and increase humidity levels for all tropical species. Excellent substrate for live plant root growth in Naturalistic Terrariums. Going to set up my own bio tank. Ordered the basics from Blue Lizard and they all arrived much sooner that I expected, they were well packaged, really pleased with the service Blue Lizard provides, just wish I lived closer so I could visit.